The little Scooba 230 and its new, larger sibling, the Scooba 390, don't just douse your floors to rinse them, but they make multiple passes to spread the cleaning solution, and then suction and squeegee that action right up. 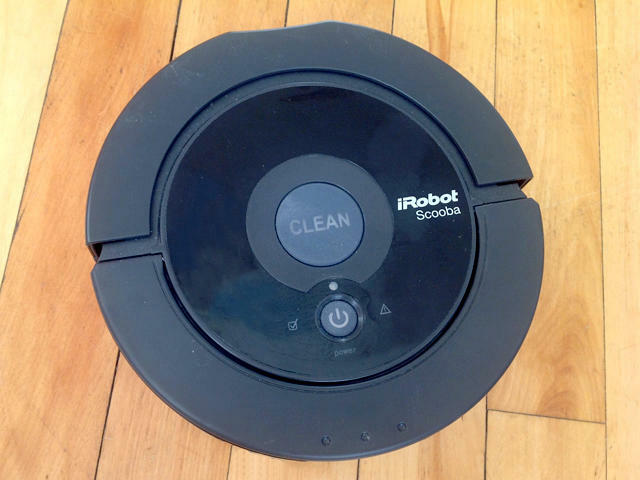 The Scooba 230 uses water with a bit of iRobot's enzymatic cleaning agent (included in the box, refills are $12 for 64 uses) or just plain old household tap water to clean a variety of floors, including linoleum, tile and even sealed hardwood. Like the Roomba, they feature iAdapt technology that uses sensors to get the lay of the land, as well as wall-following and cliff-detection. They make multiple passes to clean the floor, but since they both use iRobot's Virtual Wall technology, they don't cross the invisible barrier until the job is done. That's some smart tech there. Let's see what else this little guy can do. At just 3.5 inches tall, 6.5 inches wide and 3 lbs, this little guy is so small that you wonder just how effective it can possibly be. But that size has a purpose. This wee worker bot is able to find its way into all the little gross areas you'd rather forget about, like behind the toilet, around pedestal sinks and under low-clearance standing furniture like kitchen islands. As the size and surface area (150 square feet) didn't really make it feasible for cleaning our entire 1,000 square foot apartment, my husband and I decided to limit this unit to the bathroom area. We purposely didn't sweep the linoleum floor right before the first couple of uses, as the instructions recommend. We'd swept a couple days prior, so we left it at that, since we wanted to see how the Scooba might handle a moderate amount of cruft. End result? The mini bot took it all in stride. I had my doubts about this, considering how small it is, but the machine got all the gunk and even some of the scuffs off the floor, as well as kitty litter, bits of cat hair and stuck-on dust and fibers. Watching the bot in action, I noticed that the cleaning paths seem very random. 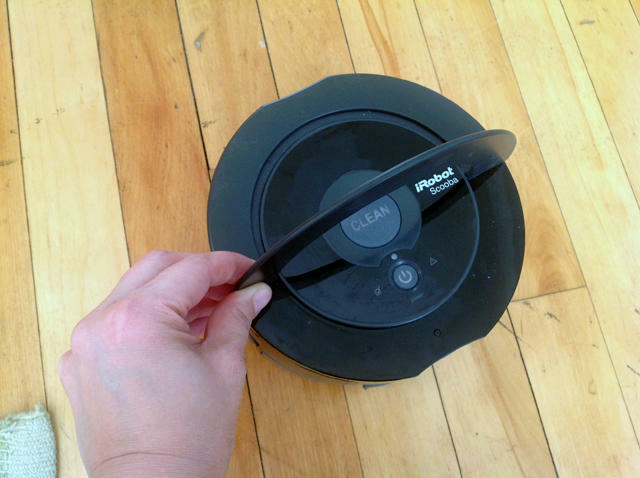 All the robots in the company's household cleaning lines seem to go from moving doggedly along walls, then suddenly turning and circling around or zigzagging across the room. Frankly, it looks like chaotic floor dancing, but there's a reason for the craziness — it's actually helping the robot map the room, which ultimately allows the bot to tackle the space more efficiently. There is some smart design in this tiny robot. 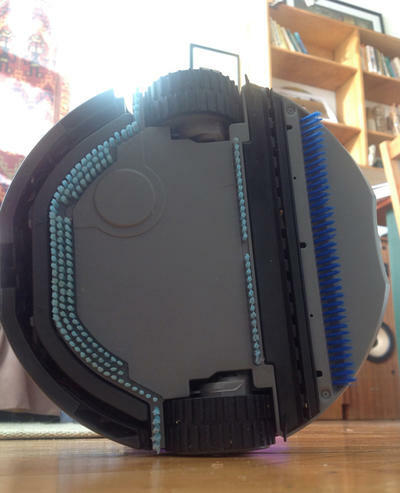 Instead of removable tanks, it features an innovative built-in dual tank that separately holds both clean water (with a dab of iRobot's cleaning powder) and dirty water. This is extremely creative — when one gets filled, the other caves in, ensuring the spacial area inside stays compact. It also ensures that no dirty liquid ever gets streaked across the floor, like traditional mops. Simply pick up the bot by the top handle and bring it to the sink for emptying and refilling. Another awesome feature is the bottom plate — the squeegee, brush bristles and suction nozzles are housed in one removable piece. Just pull it out to clean, for super simple maintenance. iRobot includes three bottom plates in the box, and replacements are also available direct from the company. When the unit's finished its work, the robot beeps to let you know it's finished, often 30 to 45 minutes later (for a medium-sized bathroom). Now that's a nice touch, as is the fact that the robot leaves the floor fairly dry. There were very minimal streaks left behind, which evaporated extremely quickly. No waiting for the floors to dry. There's a lot to like about this unit — from the easy-fill tanks and easy-clean parts to its ability to get into cramped spaces. But at the end of the day, it's all about cleanliness. So was it a deep, sanitizing clean? Hard to say. The static brush bristles, suction and squeegee seem to do a decent job, but I can't help but notice one thing — big brother 390 has a rotating brush beater that this unit doesn't. Without the ability to scrub into that surface, you've got to wonder how clean that floor really is. This is worth noting if your floor has any grooved-out grouting or uneven surfaces. Lucky for me, these aren't issues in my home, but if they are in yours, you'll want to bear this in mind. The marketing claims that the 230 "neutralizes up to 97% of common household bacteria." I don't know if this lived up to the promise, mostly due to doubts about the static brush head. The other aspect of this is that the robot only works with a solution of water plus iRobot's enzyme cleaner, or plain water. I can understand why — solutions can really vary from one brand to the next, and you wouldn't want to dump something in here that's bad for the hardware — but it would've been nice to be able to use one of my trusted cleaning brands. At face value, my bathroom floor certainly looked clean, but I don't have a CSI lab in my home to test it for sure. As a bathroom helper, I have no complaints about the 230. It excelled for crawling into areas only brave people would dare attempt, leaving them much cleaner than they would've been otherwise. And the fact that it grabbed small debris was an amazing bonus (though I don't suggest doing this regularly. Sweep the floors, as the instructions recommend). While the $300 price tag seemed very high at first, I started to change my tune over time. I still had to do the strong-arm, elbow-wrenching, manual floor-scrubbing task periodically, but not nearly so often. Over the course of a year, the time saved (not to mention aggravation) would make this well worth the cost. But only if you use it as intended. If your primary concern is big floors with some real messes on it, however, I have to say that the 230 is likely bound to disappoint. It's just not intended for that big of an area. Checking around on the webs, I also noticed that some users have reported what looks like mechanical issues with this model — from skewed cleaning paths to charging fails. I haven't encountered these glitches myself, but will definitely take note as I use this robot more. If any of these issues crop up, I'll update this post. So for now, I have to say that the 230 is a "nice to have" robot as opposed to a "must-have." It's more suited for people who absolutely abhor washing bathroom floors or other tight areas, and welcome any help they can get with it, even if it's just a light cleaning for maintenance' sake. I'd even fully recommend it, if the price — and customer expectations, for that matter — were on the lower side. If cash isn't an issue, however, you have even more options — namely one Scooba 390. On the menu of robotic cleaning technologies, the 230 might be more like a spa salad, whereas the 390 is like the entrée — a bigger, more robust offering that can take on your hunger for clean. 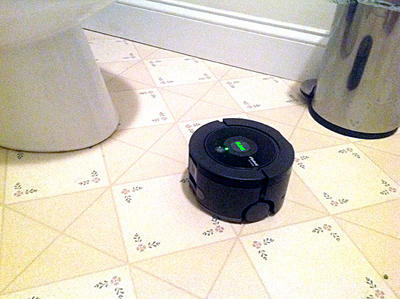 For more details or to order the Scooba 230 (or the standalone model, without the essentials kit), check out iRobot here. And stay tuned for part 3, a review of the just-launched Scooba 390 floor washer, or part 4, final impressions of all three robots.